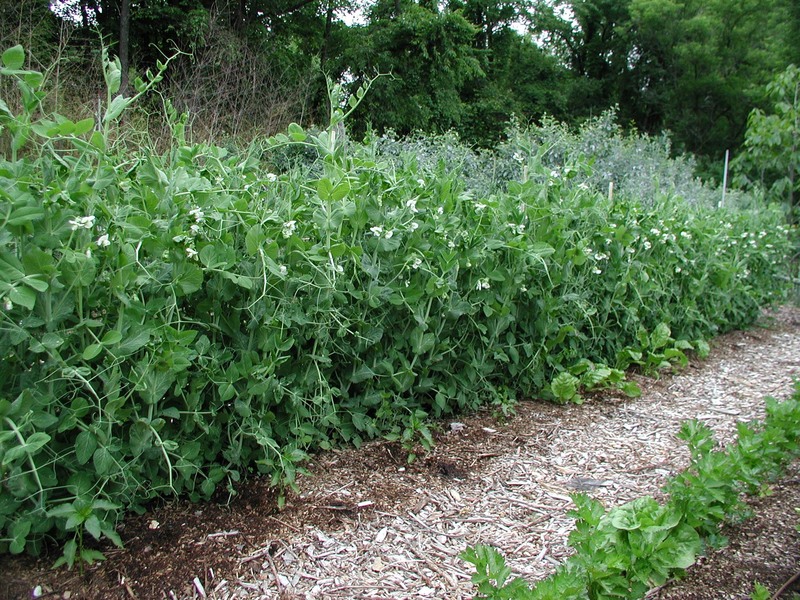 In some gardening circles, a gardener’s worth is measured by how well he or she grows peas: how soon the first pea gets to the table, the crop’s abundance, and, of course, the flavor. Sad to say, I haven’t been able to grow peas well for about 10 years. Peas require a humus-y, moisture retentive soil and early planting, all of which I provide. But about 10 years ago, just as the crop was coming on strong, vines began to turn yellow, leaves would flag, and plants would die. The probable cause was fusarium wilt disease (caused by Fusarium oxysporum). This soil-borne fungus invades plant roots and then clogs up the vascular system. Fusarium wilt probably never made it past my garden gate. It was probably already in my soil at some low level. Over the years, I’m guessing that it built up to a critical mass and was inadvertently spread — by me — on trowels, boots, and tellising. Which leads to one way to keep the disease in check: Clean trowels before planting peas; clean hoes before hoeing peas; and clean or torch the chicken wire trellises and metal support posts that keep the vines off the ground. Some pea varieties are resistant to fusarium disease. But there are a few races of the disease. A variety resistant to one race may be susceptible to another race. Planting a resistant variety one year did not ratchet up my “good gardener rating.” The plants succumbed to the disease as in other years, and understandably so since I did not know which fusarium race I was up against, and variety descriptions for wilt resistant peas don’t always specify to which wilt race the variety is resistant. One thing that I did this spring — the thing that I’m touting as responsible for my good crop — was to plant the pea seeds in my south vegetable garden, where I haven’t grown peas for the past 6 years. My wan efforts over the years have been plantings in my north vegetable garden, and they have been consistent failures. F. oxysporum f.sp. pisi survives from year to year in the soil as spores, very hardy spores. So hardy that the recommendation is frequently made not plant peas again, ever again, in tainted soil. Other recommendations are to wait 5 or 10 years before replanting. In either case, of course, it’s necessary to be very careful about spreading the disease again on tools, boots, or trellises. And again, the ideal would be to plant disease resistant varieties. People sometimes ask me if I rotate my crops each year. Crop rotation does not involve twirling plants; it’s moving certain plants — be they in a botanical family or part eaten — to different parts of the garden each year. In the case of plant families, it’s a way to reduce pest problems because family members may host the same pest (clubroot disease of broccoli, cabbage, turnips, and radishes, for example). A pest that overwinters in the ground will eventually starve if a suitable host is not on hand on which to feed. A pest that flies or that shoots spores far and wide can travel some distance to find a host, but that, fortunately, is beyond the capacity of many pests. In the case of rotating by part eaten, such as leaf, fruit, or root, the idea is to balance nutrient uptake. Leafy vegetables are hungry for nitrogen, root vegetables for potassium, and fruiting vegetables for phosphorus. It’s generally safe to rotate vegetables on a three year cycle. That is, not to return a vegetable in the same family or with the same part eaten to the same place sooner than within 3 years. Planting in beds makes this easy because once the garden is planned out, you just move the crop to the next bed, or two beds away for further distance, each year. Do I rotate my crops? You betcha’. With peas, I’ll try the 3 year rotation in the south vegetable garden. And I’ll wait at least another 5 years before planting them again in the north vegetable garden, then giving the south garden a “rest” from them. 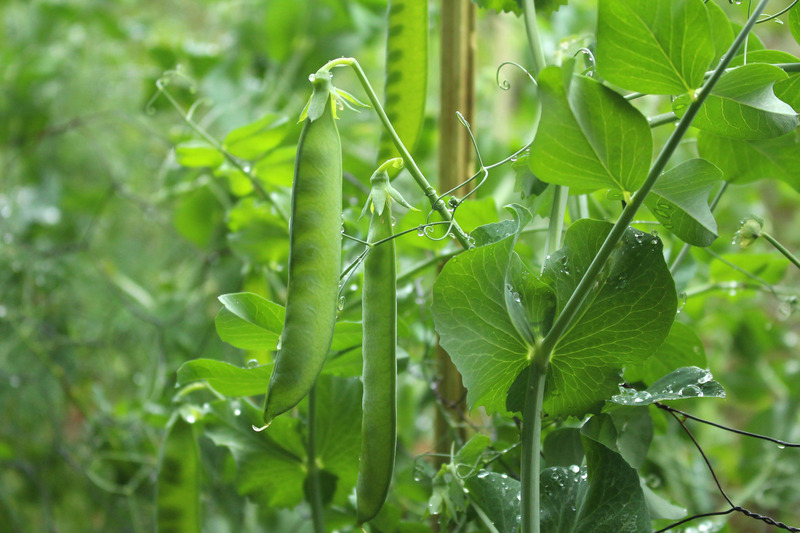 It’s good to again be unzipping green pods and scooping out the sweet peas within. This entry was posted in Soil, Vegetables and tagged crop rotation, fusarium, peas. Bookmark the permalink. Trackbacks are closed, but you can post a comment. Glad you’re back to eating peas! This is the first I’ve been able to grow them as I’m at a new garden site. They never did much in my old garden and I’m thinking this fungus may have been the reason! My girls eat them like candy so I’m so happy to finally be able to grow them. Thanks for the tips on how to not spread the fungus. PS have you thought about adding a ‘pin it’ option on your website? Would love to pin some of your photos to Pinterest as your garden is such an inspiration!